The foundation stone for the JV called Al Salem Johnson Controls was laid recently and should become operational in 2017. The company will be based on a plot of 203,783 sq m and serve as the first industrial company offering integrated heating, ventilation and air-conditioning (HVAC) solutions at KAEC. Fahd Al Rasheed, group CEO and managing director of KAEC, said: “We are delighted to welcome Al Salem Johnson Controls which joins other leading international companies that have chosen KAEC’s Industrial Valley as their base for regional expansion. The presence of ASJC further diversifies the types of manufacturing operations in the Industrial Valley and adds significant value to both the city’s and the kingdom’s economic progress and development. Rayan Qutub, CEO of the Industrial Valley in KAEC, said, “The immense investment opportunities available at Industrial Valley, which is directly connected to King Abdullah Port, position it as the new manufacturing and logistics hub and as the gateway to Saudi Arabia and the region, enabling investors to reach 250 million consumers in the Arab world in addition to East Africa. “The Industrial Valley extends over an area of 55 million sq m, which constitutes nearly one-third of the city’s total land area, and offers investors unique benefits and unmatched advantages with world-class infrastructure. In addition, the Industrial Valley includes ‘The Village,’ which is specially designed to provide housing solutions for factory workers and supervisors,” said Qutub. “To date, we have signed up with more than 93 national and global companies, of which eight are already in operation and 23 are under construction. They focus on the six industrial clusters: FMCG (fast moving consumer goods)/foods, pharmaceuticals, logistics, plastics, building materials and the automotive sector. 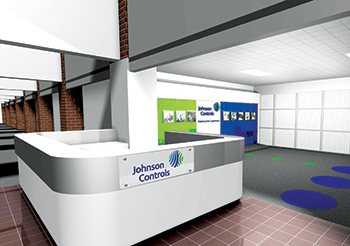 The facility will utilise Johnson Controls’ manufacturing and quality control systems, and has been designed to produce integrated solutions that increase energy efficiency and operational savings.